Watch the Royal Air Force mark their 100th birthday. 10 July 1918, the United Kingdom’s Royal Air Force came into existence. 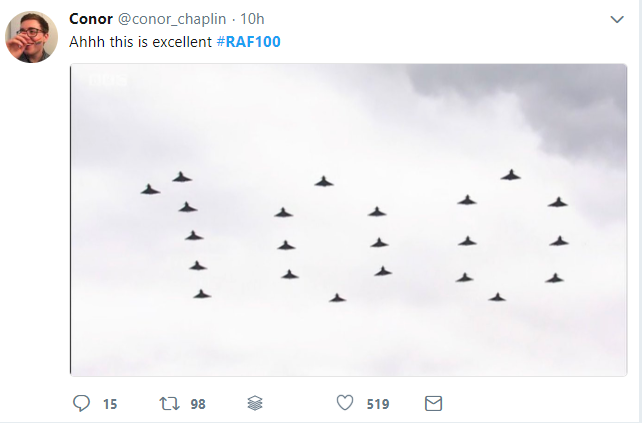 And you may ask, how did the Royal Air Force mark their 100th birthday? With one of the most spectacular flyover parade in memory. No, no, no, this was far more spectacular! This was a pretty big event in London, I dare say it might have even been bigger than the World Cup games thus far. The event had the Queen in attendance, and included more aircraft than I could identify. Some old, some new, some trainers, some cargo, some fighters, including helicopters as well! In total there were 100 aircraft. Perhaps most spectacular was what I think were the Typhoons flying in “100” formation. If you’d like to watch a slightly longer one with BBC commentary, then this may be more to your liking, it certainly includes more #avgeek shots. The Royal Air Force went all in! Surprisingly, I only happened to notice this in the wee hours of the morning on Twitter, but when I looked closer, it was completely apparent to me that the UK went all in. There’s an entire page and an app to follow the Royal Air Force mark their 100th birthday! They even put out this rather fantastic graphic identifying all of the aircraft that they had planned for the event! 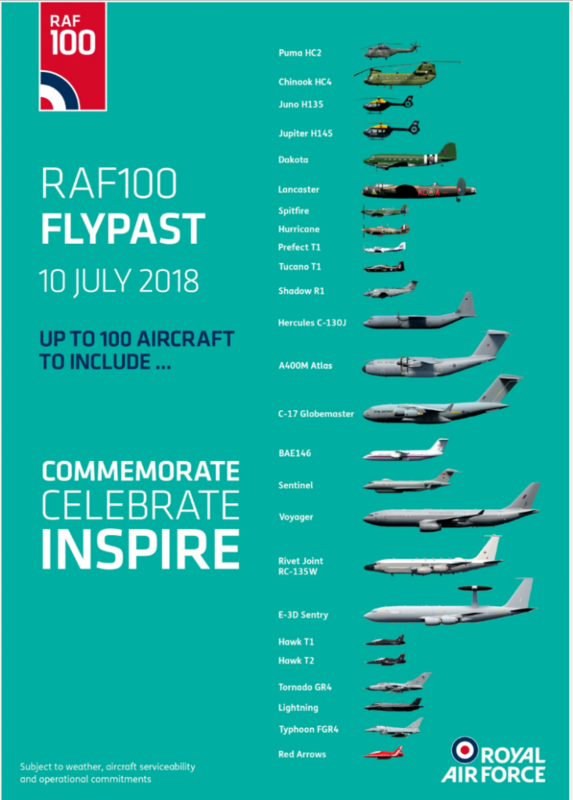 All the aircraft for the Royal Air Force’s 100th birthday. (Courtesy of the RAF). This was perhaps an air parade that won’t be topped in our life times. It was truly phenomenal to watch fixed wing, rotor, jet, and propeller aircraft in the sky over London. It was also a great reminder of how impressive and far the world’s aviation experience has come in the last 100 years. The RAF has aircraft from the US, UK, and Europe, which does make it an impressive variety. What was your favorite aircraft?